Antenna Experts ground-to-air antenna systems are supplied worldwide for mission-critical communications systems where reliability is paramount. We supply to a diverse customer base including emergency services, aeronautical/aviation, military, Government, public transport, and utility service, demanding applications requiring the utmost reliability. Our extensive ground to air antenna products range and engineering experience allow us to give our customers cost effective and dependable solutions, backed up by dedicated product support, our antenna range is unparalleled in terms of quality, reliability and price. Antenna Experts ground to air antennas are known for their streamlined aesthetics, great value, and for what really matters when youre looking for world highest performance ground-to-air antenna systems for 100% connectivity & reliability. Antenna Experts has manufactured VHF/UHF ground-to-air, ground-to-ground, and shipboard communications antennas for military and government clients. Our ground-to-ground and ground-to-air communication antennas include UHF VHF multi ports collinear sealed in fiberglass radome, stacked dipole array, log periodic antennas, discone, coaxial dipole, tactical and yagi antennas for extended rage aeronautical band antenna systems to cover the particular sector of Flight Information Region (FIR) like narrow but long strip with wider elevation beam-width or Oceanic Information Region (OIC) of a bay/gulf with wider azimuth beam-width to control the inbound and outbound Oceanic traffic. Antenna Experts ground-to-air antenna products has created a unique and comprehensive range of antennas and antenna arrays tailored specifically for civilian and military ground to air communications systems. Made to the highest standards, our ground-to-air products are unmatched in performance and reliability. Our ground to air antenna range include a comprehensive range of broadband multi-dipole antennas to cope with modern frequency-hopping transceivers, and high gain aviation band antenna systems for extended range VHF communications. Much ground to air antennas products carry NATO specification and offer high power handling to allow the use of multiple transmitters. Antenna Experts ground-to-air multi-ports antennas are vertically polarized omni antennas designed for air traffic control and ground-to-air communications. 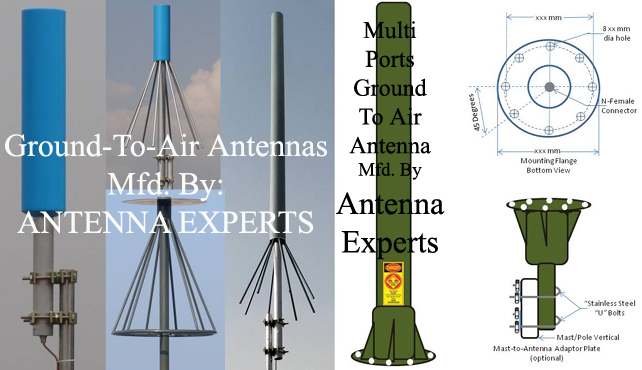 These multiple dipole ground to air antennas have various configurations of arrays available, including custom designs VHF and UHF frequencies ranging from 108-156 MHz and 225-400 MHz. Antenna Experts Ground To Air antenna systems are designed for broad-band omni-directional ground-based communications with aircraft. It is extended for use with aeronautical band radio sets which communicate with VHF UHF command radio sets in aircraft and such ground VHF UHF stations in the terminal area. Our Multi-ports collinear array concept has been specifically developed for ground-air-ground, air traffic control and base communications applications. This omni-directional concept employs a unique method of shielding the feed cables to improve radiation pattern characteristics. The multi-ports ground to air antenna also has a high degree of isolation between discrete elements within a closely spaced array. The result is a small, rugged, easy to install ground to air antenna. The lightweight and compact design minimizes space and lends itself to tactical transportable use in the most hostile environments. Our multi-ports ATC band antennas designed for future combat systems program, it has been modified to match the needs of legacy programs while significantly reducing the number of antenna required. The antenna operates with legacy radios for SINCGARS and EPLRS through new multiband radios such as the Side Hat radio. Multiple frequency inputs can be used simultaneously. The multi-ports termination feature decrease in the number of antennas required at any tower site also gives a much improved radiation pattern coverage. A minimum of 28 dB isolation is realized between any two antenna elements in every multi-ports ground to air antenna configurations. Please visit our “Aviation Band Antenna” section for more information on our range of Ground To Air communication antenna systems. Operating Temperature (-)30 to +70 Deg. C. (-)30 to +70 Deg. C. (-)30 to +70 Deg. C.
Storage Temperature (-)40 to +80 Deg. C. (-)40 to +80 Deg. C. (-)40 to +80 Deg. C.